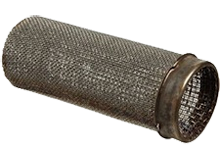 A flame arrestor of the type that is required on gasoline cans in the United States. Flame arrestors are used in many applications, including fuel storage, coal mining, and liquor production. They function by forcing the flame front through channels too narrow to support flame. Even though they are required on consumer gasoline cans, the manufacturer of over 70% of all such cans in the U.S., Blitz USA of Miami, Oklahoma, doesn't provide flame arrestors with their cans. On November 9th, 2011, Blitz USA filed for Chapter 11 bankruptcy protection after having spent more than $30 million defending dozens product liability lawsuits involving consumers killed or injured by flames or explosions while using their containers. Although the absence of flame arrestors likely contributed to at least some of these incidents, media coverage of the case has included examples of hurtfully dismissive remarks. Some are of the type that don't actually define their targets. One example: in a video report produced by KOAM-TV, as reported by The Legal Examiner of Orlando, Florida, the anchor, Dowe Quick, says at the end of the segment, "Hard to imagine some people don't understand the dangers of mixing gasoline and fire." It is indeed hard to imagine, especially in the case of Firefighter Chad Funchess, who spent over four months in a medically-induced coma after his Blitz gas can exploded while he was filling up his chain saw. One might reasonably expect firefighters to be aware of the dangers of mixing gasoline and fire. Image courtesy Edwards and Ragatz P.A. In exploring the causes and consequences of hurtfully dismissive remarks, we began with recognizing them. Then we showed how reframing them can help limit hurt by giving targets of dismissive remarks a way to understand them that includes the full reality of the remark, the offender, and the context in which the remark appears. We now turn to a perspective that can actually produce an experience of a minor bump instead of deep emotional hurt, if it doesn't prevent the experience of pain altogether. In this approach, targets reaffirm their humanity by focusing on what defines their own humanness. Here are four insights that help. Even though none of us can read minds, we tend to assume that hurtfully dismissive remarks are intentional. Many are. For example, the probability of intentionality is high for repeat offenders. But before taking action, it's worth verifying intentions — privately, if possible. If the remark is unintentionally hurtful, target and offender can often reach a new understanding that strengthens their relationship. What the offender says is merely an assertion, or even less — an insinuation. It isn't proof in itself. It doesn't define the target. Targets do better when they recognize false assertions and insinuations as false. Others might overhear the remark, but how they respond to it is their choice. People are free to receive information and conclude whatever they feel is appropriate. Targets must accept this freedom that others have, but targets need not accept the content of the dismissive remark. addressing the wrong problemresponsible for their own beliefs about themselves. Targets who know that a remark is misleading or wrong have all the tools they need to reject the remark, at least internally. Dismissive remarks can't directly harm targets who truly believe the remarks are bogus. What can be problematic is that others might be misled by the remarks, but that's a different problem. Confronting the offender might be helpful if the bystanders witness the confrontation and accept the target's position. But confrontations can often produce yet more hurtful remarks. And because confrontations appear to be self-serving for the target, many bystanders discount the target's counter-assertions. To others, the whole thing looks like a brawl, especially when the confronter (the target) is humorless, or worse, angry. Confronting the offender in the workplace context rarely helps. Instead, approach bystanders personally. Deal with their willing acceptance of false insinuations directly. That's the real problem. Would you like to see your comments posted here? rbreneFZFmCqNbZSdwRHener@ChacAkdFyrorqoDszjmSoCanyon.comSend me your comments by email, or by Web form. Most advice about influencing others offers intentional tactics. Yet, the techniques we actually use are often unintentional, and we're therefore unaware of them. Among these are tactics exploiting cognitive biases. I offer email and telephone coaching at both corporate and individual rates. Contact Rick for details at rbrenirAojotYgndgMbsZner@ChacErwCjUBZqbogwZwToCanyon.com or (650) 787-6475, or toll-free in the continental US at (866) 378-5470.